Volunteers applaud at anniversary celebration. From left: Bob Oderkirk; Diane Hnat, SFO; Jeannette Williams, SFO; Ana Pereira. 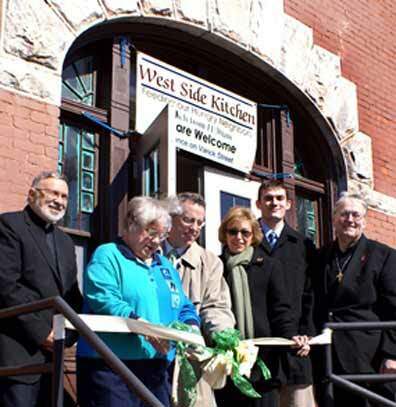 UTICA -- Mother Marianne's West Side Kitchen celebrated its first anniversary March 10, 2009 with a Mass and reception for the volunteers at the soup kitchen. "By the grace of God, after one year, we know it is a privilege to be able to serve people in our community...especially those who are hungry or in need," Fr. 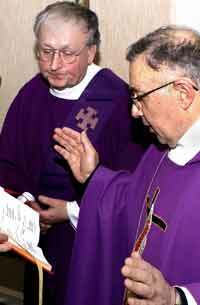 Richard Dellos, pastor of St. Joseph-St. Patrick Church, said during Mass. The soup kitchen serves lunch Monday through Saturday and is named after parish daughter Bl. Mother Marianne Cope, missionary to the lepers of Molokai. The number of meals served surpassed 20,000 a few days before the one-year mark, noted Deacon Gil Nadeau, director. "We have over 100 volunteers, and 10,000 volunteer hours for the year," Deacon Nadeau said. "You can't put a price tag on that...Everything is totally volunteer. That's why it works, why we're self-sufficent." While enjoying refreshments and cake, a number of the 35 volunteers who attended turned their thoughts to the people they serve, and to an unexpected joy of working together. "One of the wonderful things is when the people come in, they thank us for the food, and when we smile, they thank us for smiling," said Ana Pereira. Added Diane Hnat, SFO: "I can't tell you how nice the people are. If you say, 'God bless you,' they say 'God bless you' back." Bob Oderkirk, who with wife Donna coordinates the weekly Wednesday evening food production, mentioned how blessed they were with the 20-plus volunteers who turn out every time they get together. Each of the past two production nights, the crews prepared over 1,000 sandwiches and over 20 gallons of soup. "We're able to keep the freezers stocked...and it doesn't seem like work." They start the evening with prayer, with helps set the tone, he said, and suddenly, the fun starts. "You can show up tired, and in five minutes, you're not tired anymore."